In this work we propose a new formulation for high-order multi-moment constrained finite volume (MCV) method. In the one-dimensional building-block scheme, three local degrees of freedom (DOFs) are equidistantly defined within a grid cell. Two candidate polynomials for spatial reconstruction of third-order are built by adopting one additional constraint condition from the adjacent cells, i.e. the DOF at middle point of left or right neighbour. A boundary gradient switching (BGS) algorithm based on the variation-minimization principle is devised to determine the spatial reconstruction from the two candidates, so as to remove the spurious oscillations around the discontinuities. The resulted non-oscillatory MCV3-BGS scheme is of fourth-order accuracy and completely free of case-dependent ad hoc parameters. 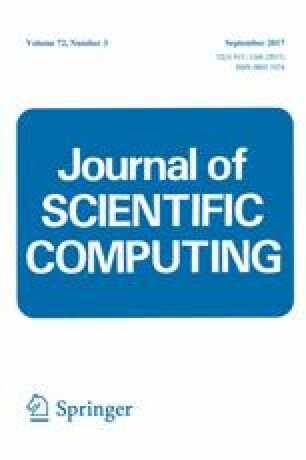 The widely used benchmark tests of one- and two-dimensional scalar and Euler hyperbolic conservation laws are solved to verify the performance of the proposed scheme in this paper. The MCV3-BGS scheme is very promising for the practical applications due to its accuracy, non-oscillatory feature and algorithmic simplicity. This work was supported in part by JSPS KAKENHI (Grant No. 15H03916) and National Natural Science Foundation of China (Grant No. 41522504).